Hello everyone, today we’re going to be taking a look at 11 of the best solar watches currently available for men. Our guide to the best solar watches on the market aims to provide you with many of the essential details you need on each model featured. So what features were important to us when putting this list together? We’ve only considered watches made out of high quality materials from some of the most well known brands on the planet. We had no interest in featuring super cheap timepieces that could possibly break within a year. Our list only features watches designed with quality movements and materials. Each watches in today’s list is intended to offer value for money, ok maybe bar one (The Tissot at number 9 is a one off expensive solar watch). When you buy a timepiece you want to ensure that you’re getting your monies worth, that’s why I’ve stuck to brands that are renowned for offering excellent value for money. Let’s be honest, watches are being used less and less these days for actually telling the time. A watch needs to do more than this now, it has to feel great on the wrist, look good, and operate seamlessly. Again, I’ve stuck to watch brands known for their quality control. What Are The Best Solar Watch Brands? 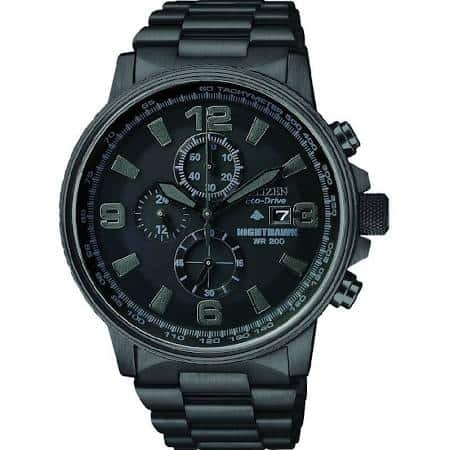 Citizen’s range of Eco-Drive watches have taken the market by storm. They proved so popular for Citizen that now the large majority of their new models feature the technology. 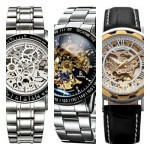 They have everything available from solar powered dress watches to sports timepieces and more. You can view the full range of Citizen Eco-Drive watches here on Amazon. Another one of the world biggest watch brands is Seiko. We’ve covered their popular Seiko 5 watch range in the past which has been a pretty big hit. They’re known for offering excellent value for money and producing some of the best quality watches in the world. 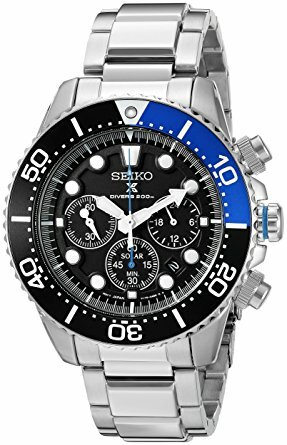 You can view more Seiko solar watches on Amazon. There’s no denying that Casio’s range of solar and Tough Solar watches has proven a big hit. 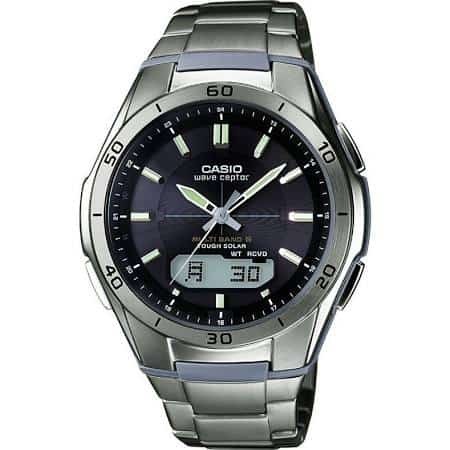 Casio are known for their durable watches that feature a huge range of functions and features. This is where Citizen and Casio differ quite a bit in my opinion. If you need a larger outdoor suitable watch, I’d go for Casio. View all Casio Tough Solar watches on Amazon. How Do Solar Watches Work? So how do solar watches actually work? Solar watches recharge themselves using the power of light, often both natural or artificial lighting can be sufficient. The key benefit of solar watches of course, is that fact that you don’t need to keep replacing the batteries when they run out. Citizen’s engineers for example project that even after 20 years, their batteries will still retain 80% of their ability to be recharged. The basics of a solar movements workings by letting light energy pass through the dial to be received by a solar cell unit. This energy is then converted into electronic energy and is then stored in a rechargeable battery so it can then be used to power a quartz type movement. 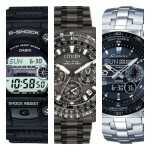 Those are 3 small articles that explain how each brand makes use of technology for their popular solar watches. By having a quick read through of any of them you’ll have a good idea how solar watches work, and how best to care for your solar watch. Many of the watches featured in today’s list of the best solar watches have reviews available on this very site. Where available I’ve linked off to each watches’ review at the bottom of its segment. If you’d like to learn more about any of the watches featured I’d recommend just clicking on its review. Below I’ve put together a list of 11 of the best solar watches currently available. There’s a wide range of styles to choose from so whether you’re after a solar dive watch or a simple solar dress watch, there should be something here for everyone. If you’d like to know more about any of the watches featured here simply comment at the end and I’ll try and answer your questions as soon as I can. For now, enjoy today’s list of the best solar watches for men. First up in today’s list of the best solar watches is this popular Seiko Prospex. 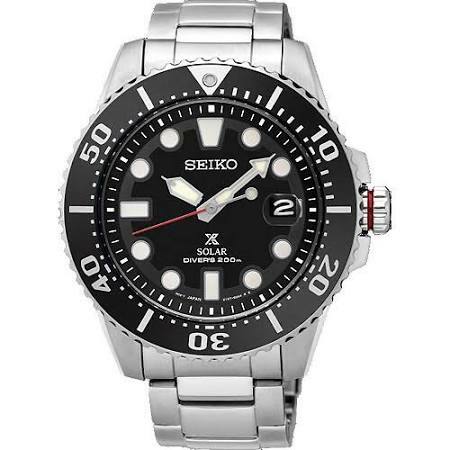 This is a quality Seiko diving watch that’s built with a stainless steel 44mm casing with a thickness of 12mm. The strap is also made of stainless steel and fastens with a fold over style clasp. It has that classic diver’s style dial design with a clear and easy to read display with large lume filled hour markers and bold hands for better visibility in dim lit conditions (like when you’re diving). There’s a magnified date indicator at the 3 o’clock position too. The Seiko watch features an impressive solar movement that means the watch is powered by light, be it natural or artificial and never requires a battery. This makes it one of the best solar watches for diver’s, on today’s list. A Hardlex mineral crystal glass has been used to protect the timepiece from scratches or shattering. This affordable diving watch also comes with an impressive diver’s 200m water resistance rating which means it’s ISO certified. You can read my full Seiko SNE437P1 review here soon. Next up in today’s list of the best solar watches is the incredible Citizen Nighthawk that features as one of our best black chronograph watches for men. The Citizen Nighthawk is built with a black ion plated stainless steel casing that has a 42mm diameter and a thickness of 13mm. The strap features the same black ion plating and fastens with a fold over deployment clasp. The striking Eco-Drive watch features an intelligent design that’s set around a multitasking dial with date function, chronograph and black combination numeral and baton style hour markers. The chronograph functions include measuring up to 60 minutes, 12.24 hour time, and 1/5 of a second. The watch also has a screw down crown and screw down caseback. Powering this timepiece is a B612 Eco-Drive solar movement, the Eco-Drive technology proved so popular that it’s now found in the majority of Citizen’s newest watches. A specially hardened mineral crystal glass offers you a good level of resistance to scratches and shattering. It also has a 200m water resistance rating. You can read my full Citizen Nighthawk review here. Here we have the incredible Casio Pro Trek, a couple of timepieces from this collection recently made it into our list of the best fishing watches. The Casio Pro Trek is a pretty serious bit of kit packed full of features so it offers very good value for money. 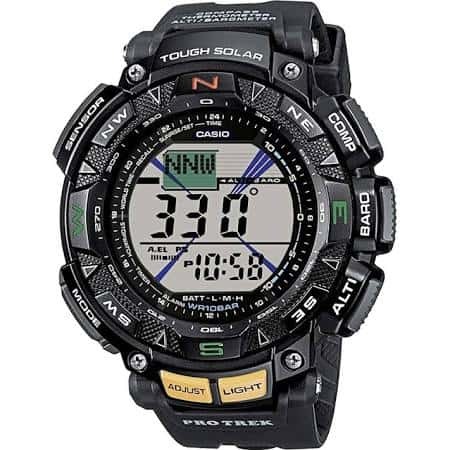 Features of this Casio Tough Solar Pro Trek watch include a triple sensor, compass, thermometer, barometer, and altimeter. It also features a backlight for better visibility, a chronograph function, and alarm. This Casio Pro-Trek watch is built with a combination of stainless steel and resin parts to give it a lighter weight design. The casing has a 50mm diameter with a thickness of 15mm making it quite an oversized watch. The strap is made of a comfortable black rubber and fastens with a buckle style clasp. Of course, powering this watch is a Tough Solar movement meaning the watch uses light to power the watch. When the timepiece is stored without light for long periods it shuts down the display to extend the battery life, a handy feature in my opinion. A mineral crystal glass lens protects the front of the watch giving you a good amount of resistance to scratches and shattering. It also has a 100m water resistance rating that’s likely to come in pretty useful to some people. You can read my full Casio Pro Trek review here soon. Up next we have this Citizen Diving watch, the Promaster Eco-Drive. The Citizen BN0151 is an awesome choice if you’re after an affordable high quality diving watch with a solar movement. The Citizen Promaster is built with a large 40mm stainless steel casing with a thickness of 11mm. It features a rotating bezel and the crown in the 4 o’clock position which you don’t see so often. The strap is made of a comfortable blue rubber and fastens with a buckle style clasp. 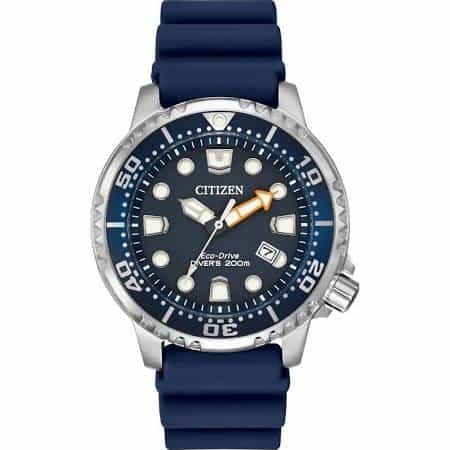 As you’d expect from any decent Diving watch, this Citizen watch features a high visibility contrasting dial design with large bold hour markers and wide hands that are both coated with lume for better visibility in dim lit conditions. There’s also a handy date display at the 4 o’clock position on the dial. Powering this popular solar watch is an Eco-drive movement that uses the power of both artificial and natural light to run the timepiece. A mineral crystal glass helps to prevent scratches and shattering. It also features a high end diver’s 200m water resistance rating with ISO certification. You can read my full Citizen Promaster watch review here. Casio’s selection of Waveceptor watches offers brilliant value for money with their huge range of functions. It’s rated among the best titanium watches with a solar movement. The casing has a diameter of 42mm with a thickness of 12mm and is made of titanium which is lighter and stronger than stainless steel. The strap is also made of titanium and fastens with a fold over deployment clasp. This Casio Waveceptor watch has a wide variety of useful features and functions. It makes use of atomic timekeeping with its radio signal reception making it a very accurate watch. A combination of LED lighting and a Neo-display provide a couple of options when it comes to visibility in dim lit conditions. There’s also a battery level indicator to display how much power you have remaining. Extra functions of the Casio Waveceptor include a world time function, stop watch, timer, 5 daily alarms, button tones on/off, multi-language, automatic calendar, and 12/24 hour timekeeping. As you can see, it packs quite a lot in. The water resistance rating of this model is 100m. You can read my full Casio Waveceptor review here. 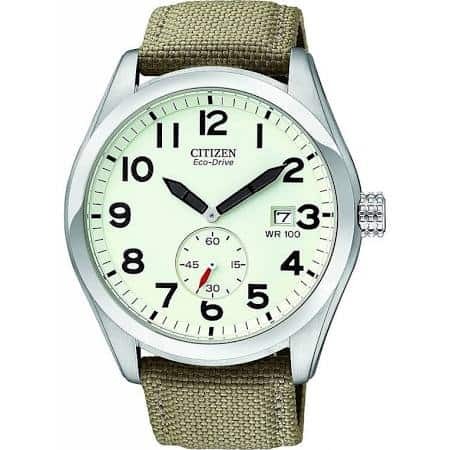 In at number 6 we have a Citizen atomic timekeeping watch that’s powered by a Eco-drive movement. This Chunky men’s chronograph watch is built with a 42mm stainless steel casing with a thickness of 13mm. The strap is made of a soft genuine leather with contrasting white stitching and fastens with a buckle style clasp. Powering this popular Citizen watch is a radio controlled solar powered movement. This uses the power of light to operate the watch, be it natural or artificial lighting. Being a radio controlled watch ensures that this watch is kept incredibly accurate as it syncs up with an atomic clock. This watch is full of useful functions and features that I cover in my E650 movement guide here. It features a sapphire crystal glass which gives you an excellent level of scratch resistance with a Mohs hardness rating of 9. It also uses a perpetual calendar, chronograph, tachymeter, and alarm function. This watch has a 200m water resistance rating too. You can read my full Citizen AT4000-02E review here. In at number 7 we have another one of the best solar watches that’s suitable for divers. It features this brilliant large rotating bezel with this blue segment that makes the watch stand out on your wrist. The stainless steel casing has a diameter of 44mm with a thickness of 14mm. The strap of this diver’s Seiko watch is also made of stainless steel and fastens with a deployment style clasp. Like many of the Solar diving watches featured so far, the dial design on this model has an easy to read style with bold hour markers and wide hands. The hands and hour markers are coated with LumiBrite for excellent visibility in dim lit conditions. There are 3 chronograph sub dials on display as well as a small date indicator tucked between the 4 and 5 o’clock hour markers. Powering this timepiece is a popular Seiko V175 solar quartz movement for reliable and accurate timekeeping. A hardlex crystal glass is used to give you a good level of resistance to scratches and shattering. It also features a 200m diver’s water resistance rating with ISO 6425 certification, this meets all international standards for a true dive watch. You can read my full Seiko SSC017 solar watch reviews here soon. The G-Shock Rangeman is an excellent solar watch that’s packed full of useful functions and features, it recently featured in my best watches for police officers article. 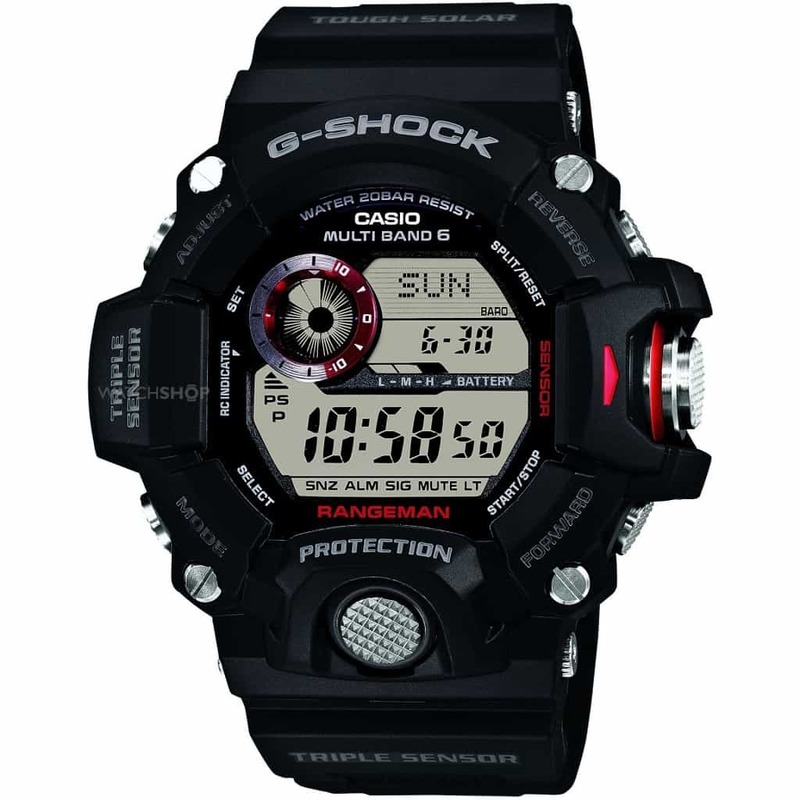 This is an oversized G-Shock watch with a huge 53mm casing diameter and a thickness of 18mm making it quite chunky. The casing is made of stainless steel with a thick resin surround. The strap is made of plastic/resin and fastens with a buckle style clasp. Casio’s Tough Solar technology is used on this timepiece to power the quartz movement, it can be powered by light, be it natural or artificial just like the Eco-Drive movements. It’s also radio controlled and syncs up with atomic clocks in EU, USA, Japan, or China. Extra functions of what’s considered one of the best G-Shock watches are a barometer, thermometer, digital compass, 10,000m altimeter, sunrise/sunset display, world time functions, stopwatch function, chronograph, timer, alarms, automatic calendar, 12/24 hour display, and more. It also has an impressive 200m water resistance rating that’s bound to come in useful. Check out our best rugged outdoor watches for more timepieces like this. You can read my full Casio G-Shock solar watch review here soon. 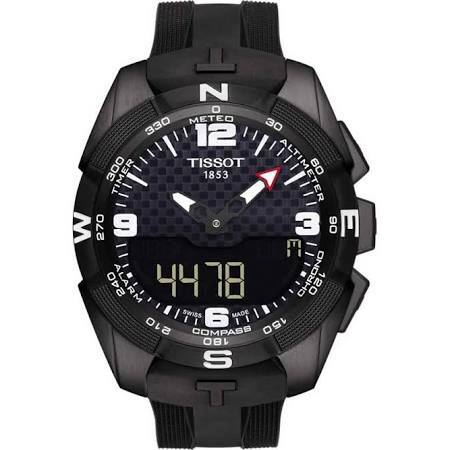 If you’re after something a little more luxurious than this expensive solar watch from Tissot is worth considering. You can read my full Tissot watches review here for a look at the brand as a whole. It’s a beautiful dual display analogue digital watch that’s built with a black ion-plated titanium casing. This titanium casing is lighter and stronger than stainless steel, the diameter of the casing is 45mm and it has a thickness of 14mm. The strap is made of a thick comfortable rubber and fastens with a fold over clasp. On the dial, we have a dual display with digital and analogue aspects. The hands have a thick design that goes with the bold numeral hour markers to stand out well against the black textured background. The hands have a coated of lume for better visibility in dim lit conditions. Functions of this watch include a chronograph, altimeter, alarm, backlight, timer, and compass. This Swiss made watch features a Tissot ETA Caliber E84.301 solar watch movement for excellent timekeeping and reliability. A scratch resistant sapphire crystal glass has been used on this model to provide you with some of the best scratch resistance available. It also has a 100m water resistance rating. You can read my full Tissot T-Touch solar watch reviews here soon. 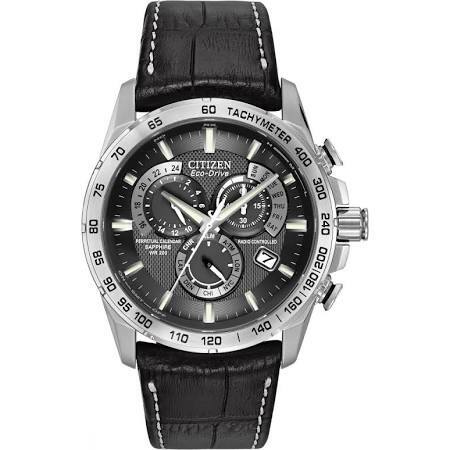 In at number 10 on our list of the most popular solar watches for men is this Casio Edifice Tough Solar watch. 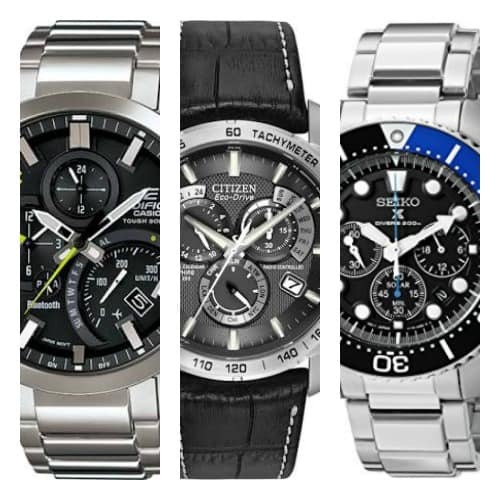 You can take a look at more of the best Casio Edifice watches here. Casio’s Edifice collection differs in design from the G-Shock range but still keeps to filling their watches with tons of useful functions. This large stainless steel watch has a diameter of 43mm with a thickness of 15mm, again making it quite chunky. The strap is made of matching stainless steel and fastens with a fold over style clasp. Powering this watch is the popular Tough solar watch movement that uses the energy of natural or artificial light to run the timepiece. Protecting the front of the watch is a mineral crystal glass lens, giving you a good level of both scratch and shatter resistance. It also features a 100m water resistance rating. 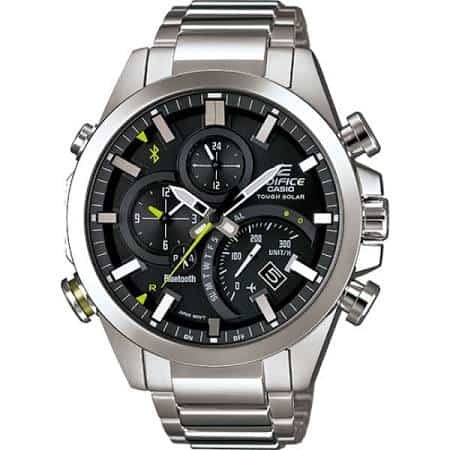 Features of this Casio Edifice solar watch include a dual dial world time display, daily alarm, day indicator, date display, and smartwatch Bluetooth functions. To learn all about these extra Bluetooth and smartwatch features I recommend reading my full Casio Edifice EQB-500D-1AER review. Up last in today’s list of the best solar watches is this affordable Eco-Drive timepiece. this is more of an understated timepiece so it differs a lot from the chunky watches that we’ve seen from Seiko and Casio so far. The casing of this model is made of stainless steel with a diameter of 44mm and a thickness of just 11mm. The strap is made of a khaki coloured nylon material and fastens with a buckle style clasp. The dial features large, bold numeral style hour markers that stand out brilliantly against the cream coloured background. I love the use of a separate sub-dial to display the seconds, this is one of my favourite layouts on a dial. I’m also a big fan of the knurled crown design. At the heart of this timepiece is a solar powered Eco-Drive movement. This means the watch uses the power of light to charge up the battery and operate the timepiece. A mineral crystal glass has been used to give you a good level of resistance against scratches and shattering. It also has a 100m water resistance rating that’s bound to come in handy. You can read my full Citizen BV1080-18A review here. Thanks for taking the time to read through today’s list of the best solar watches. What was your favourite solar watch featured today? Comment below and let us know.